When publishing a story to an output channel such as a Web site, it will most likely contain some text (unless you are just uploading one or more images to Facebook for instance). The text is usually also split into several text blocks: one containing the title of the story, another containing the actual story, and so on. In Enterprise, the text in each of these blocks is taken from (and stored in) an article component. These components do not have to be part of the same article: simply choose an article component from any article that is present in the Dossier, or create a new article component from scratch. Figure: When adding text to a Publish Form, you can choose to create a new text component or use an existing one. It is also possible to copy an existing component and use that as a base for a new component. Use the New button to create a new article component from scratch. As a result, a new article containing a single article component is created. Use this method if you want to create a new article component based on an existing component. This can be useful when an article component exists which already contains most of the content that you want to use. You can use it as a starting point and edit it without affecting the article component that you are basing it on. The result of this method is that a new article containing a single article component is created. Making a copy of a component that exists in any of the articles that are in the Dossier. Do this by clicking the Existing Component button. The "Select Article Component" window appears, showing all components of all articles that are currently in the Dossier. Select the article component that you want to use and click Use Copy. 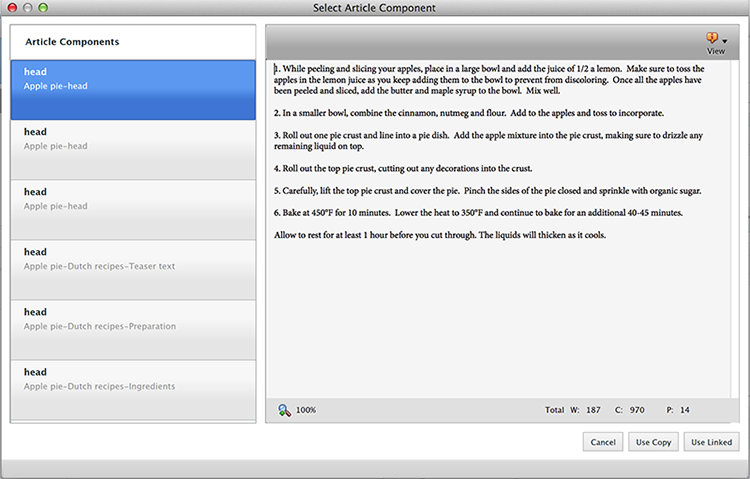 Making a copy of the article component that is currently used. To do this, use the Copy button in the toolbar. Use this method if you want to add an existing article component as a link to the original component. This method is useful when the component exactly contains the content that you want to use and when you want to make sure that when the content changes, that the article component in the Publish Form also changes. Caution: This also works the other way round: when making a change to the article component in the Publish Form, all other locations where this article component is used are also changed. Figure: Article components that are used in multiple locations display an icon in the Select Article Component window. Hovering over the icon will show a tooltip with the exact locations. In the toolbar of the article component in the Publish Form, an icon appears for each Publication Channel in which the component is used. Hover the mouse pointer over an icon to see the exact location. Figure: Article components that are used in multiple locations display an icon in the toolbar of the component in the Publish Form. Hovering over the icon will show a tooltip with the exact locations. The Select Article Component window appears, showing all article components of all articles that are currently in the Dossier. Step 2. Select the article component that you want to use and click Use Linked. The article component is added to the Publish Form and can be edited in exactly same way as any other article component. Use this method if you want to replace an article component in the Publish Form with a new component or with an existing component. The starting point is of course a text block in the Publish Form in which an article component is already added.